A vacuum chamber made from a glass jar. they can be omitted if this will not be the purpose of the vacuum chamber. Ensure that the lid is screwed on tightly before evacuating. 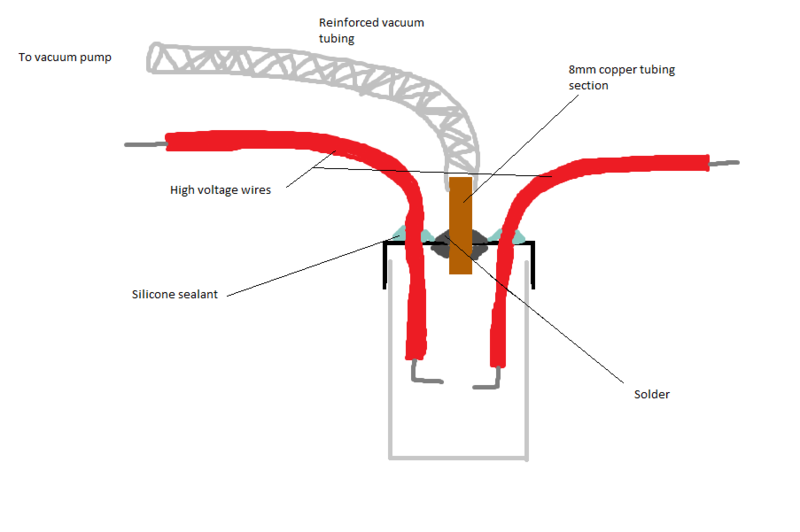 the copper tubing then connects to a vacuum pump. I connected the HV wires on mine to a flyback transformer, but seperated the wires inside such that an arc would not form. I then began to evacuate the jar, and after a short period, an arc formed between the wires, which became more like a spherical glow as the air pressure inside decreased. I was using a freezer compressor, which attains an estimated 90% vacuum. so about 424KG is exerted over the total surface area of the glass jar, excluding the lid (524KG including the lid). resulting in a violent and loud implosion, complete with flying pieces of glass and metal. this will absorb much of the force if it implodes, saving you from untimely (or otherwise) death or serious injury. Another thing I would suggest would be to use a glass jar which is thick, and perhaps which has some flat edges.